Blog › Do CEOs Appreciate Marketing’s Contribution? Research from our latest State of the Marketing Profession has pointed to marketing’s steadily growing strategic role. It has found that marketing groups are planning to allocate an estimated 13% of their budgets to strategy and planning, up from last year. Areas covered include market/competitor intelligence, opportunity identification, brand and positioning, buyer insight, and go-to-market planning. Another indication is that 57% of respondents agree that marketing brings insight and innovation to the business compared to 43% in 2018. Meanwhile, 48% declare that they provide valuable input to guide business strategy, up from 44% last year. Here’s the not-so-good news. 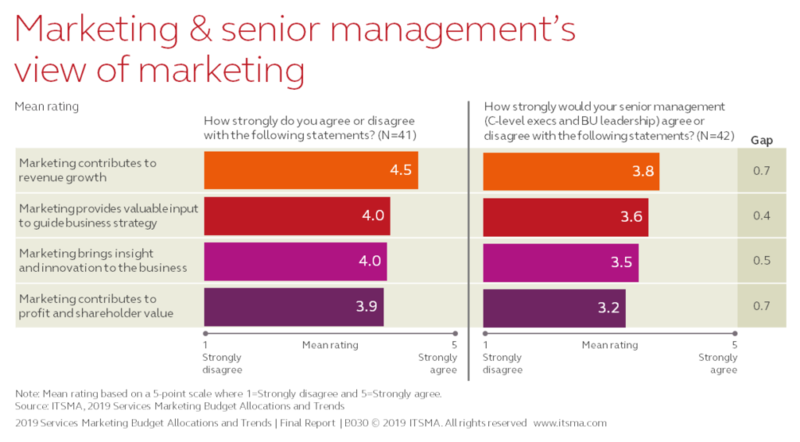 The study finds there is still a gap between marketing’s view of the value it brings to the business and the perceived view by senior management of that value. For example, marketers strongly agree that marketing contributes to growth. However, when asked how they believe that those in the C-suite and business unit leaders rate their contribution, the response is less positive. It’s a similar story when rating marketing’s provision of valuable input to business strategy, bringing insight and innovation and its contribution to profit and shareholder value. There are a number of possible reasons for this. Among them: certain leaders simply don’t value marketing as they should, while a lack of accurate data can prevent a clear line of sight between marketing activities and their impact. Marketing as a function obviously needs to educate senior management by doing a better job communicating its value. After all, marketers are often in the same room: a significant 63% of study participants say that the marketing organization reports directly to the CEO. So there’s no excuse. Marketers should be setting the right targets in accordance with business outcomes, measuring against them, and establishing benchmarks that can then be translated into the results that senior management can understand—and hopefully applaud! For marketing departments trying to increase their influence and build credibility within their companies, reporting is a critical tool for shaping perception and demonstrating results. Use ITSMA’s step-by-step guide to address the methods and metrics you use in your reporting to accelerate your progress on the path to becoming a strategic business function.